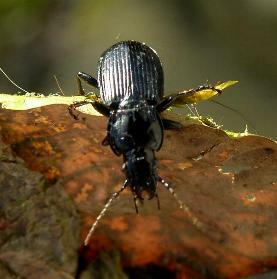 There are about 20,000 species of Carabids in the world, and about 340 in the British Isles. Most are shiny, blackish brown with some having a metallic sheen. 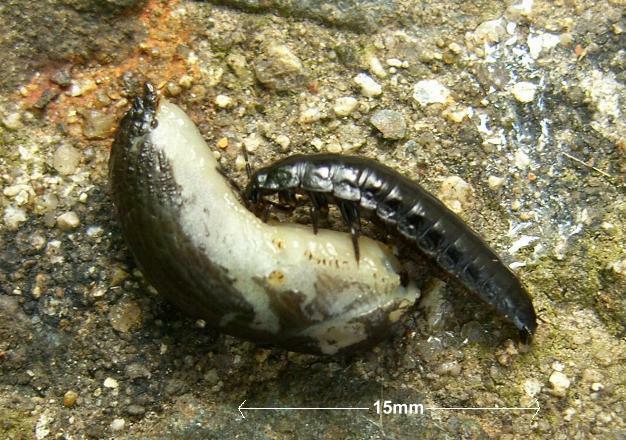 They have well developed mandibles and adults and larvae are both carniverous, preying on worms, slugs, insects, and most importantly here in Northern Ireland, adult New Zealand Flatworms. They spend most of their time on or under the ground and hunt mainly at night, some climb into trees, shrubs, and crop plants to hunt. 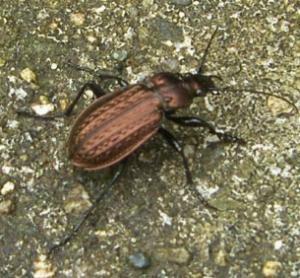 Ground beetles are often found in houses in the spring. They may crawl around basements or ground floor rooms or fly to bright lights, but are not known to bite people. Two examples of ground beetle, the left hand one is Pterostichus melanarius, the Common Black Ground Beetle. Female ground beetles lay eggs in the soil. Eggs hatch into larvae that feed in or on the soil under debris. Depending on the species, there may be several generations per year. Both adults and larvae are beneficial because they feed on larvae of harmful insects and are an important part of the natural animal population in turf, pasture, and crop land. This Ground Beetle Larva was totally engrossed with its slug meal. See also the Vine Weevil which has a similar shape but is about half the size of a ground beetle.